Arroyo Miranda, the final leg of El Camino Real looking south towards Picuris. 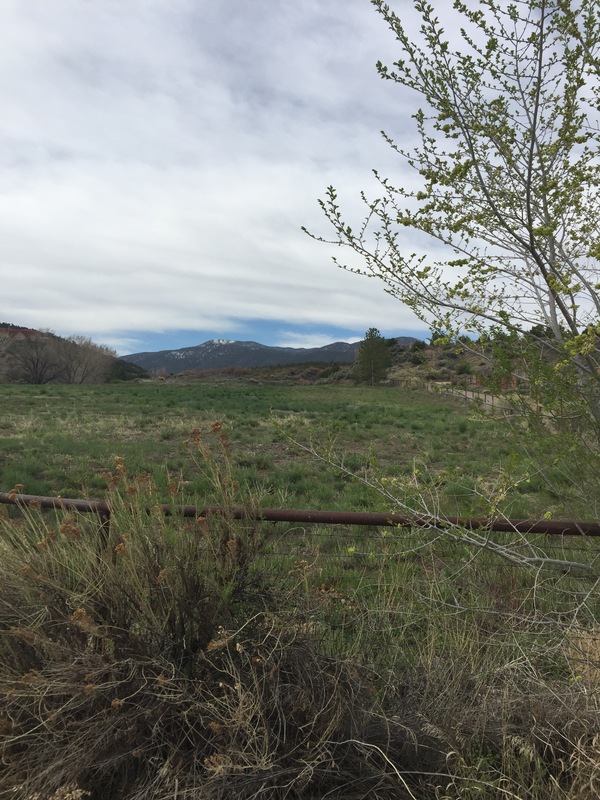 This photo taken on the outskirts of Talpa, near Taos, New Mexico, April 18,2017. This photo is framed for a historical record. It is not a pretty picture per se , but accurate as to the Royal Road from Mexico City northward to Santa Fe, the pueblos, and Taos. According to Spanish documents, this final part of the Royal Road leading to Taos went from Trampas to Picuris Pueblo, slightly east to Vadito, then up Telephone Canyon around Picuris Peak, and then connecting with the Arroyo Miranda, traversing the east side of the arroyo. The above photograph is looking south, up towards the Picuris Peak area. Lying behind me is Talpa that is close to Rancho de Taos and Taos. The map below indicates the route into Rancho de Taos. Note Telephone Canyon, Arroyo Miranda, Rancho de Taos, and Taos. Carson National Forest Map, 2017. The following are my field notes from the trip, showing the route as I described. Jack Matthews Field Notes, April 18, 2017. The El Camino Real is only partially open to public transit through the Carson National Forest. The final leg is on private land and closed to public transit. The Royal Road, however, can be followed within two miles of Talpa and one can sidestep to SH 518 and hike into Taos. Last October, I followed the route of the Sibley expedition from approximately Council Grove, Kansas, through the Cimarron Grasslands, to McNees’ Crossing in NM before I had to head for home. It was a wonderful experience, as yours surely was. I’m glad to hear about it. I like the thought that there are people out roaming around, reliving history and breaking new ground.